"Martinis are like breasts, one isn't enough, and three is too many." ~ Herb Caen, who died in 1997. "I must get out of these wet clothes and into a dry martini." There is just something right about a gin martini. I find that I like a more classic martini than a more contemporary super-dry version. I also learned that I prefer Noille Pratt vermouth over the more common Martini brand. Is it still a martini then? Hmmm. I found the best olives at the local coop, and buy only 6-8 of them at a time so that they stay fresh. They are unstuffed, but I generally keep feta cheese in the house for salads, so I have taken to stuffing my martini olives with feta. It's not quite a fetish, but I think it's reaching the ritual stage. 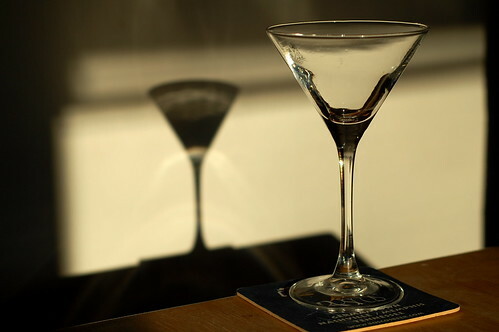 A final thought: Those big honkin' "martini" glasses are not for martinis. They are for frou-frou Cosmopolitans that are half juice. I went to an antique store and bought this classic glass and keep it in the freezer (near the gin and the shaker) so it's always ready.